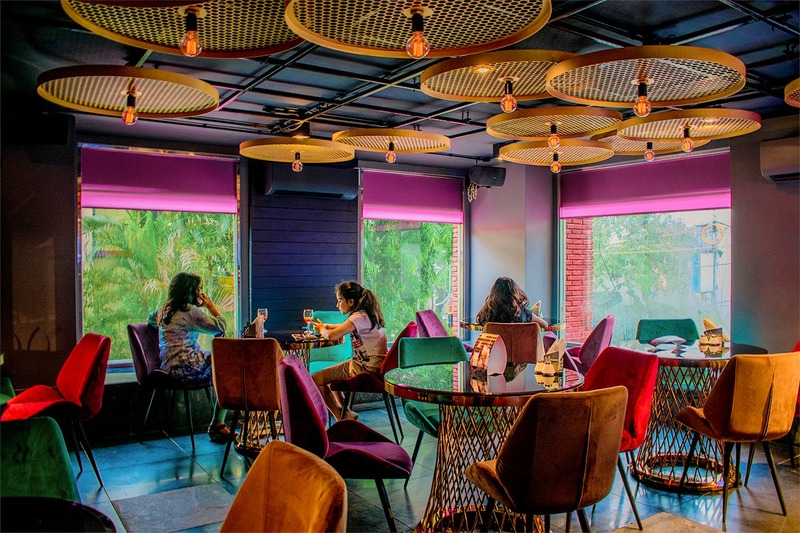 A café and a shisha lounge rolled in one, Haze in Hazra is the swanky new twin of Nocturne’s lounge bar that goes by the same name. Art deco interiors with chrome, mirrored walls and pop colour furniture, Haze has a spiffy cool vibe that’s swiftly turning it into a hot hangout spot for millennials. The dimly lit and well spread out shisha lounge (walled off from the café) is a major plus. Our fave nook is, of course, by the large floor-to-ceiling windows that overlook the busy streets of Sarat Bose Road. Give the Elaichi Mint or the 3 Paan Kiwi Salsa a drag. And beat the stifling heat with their refreshing Aam Panna Ginger Ale Mojito and get dipping with their delish pizza fondue that we stuffed our faces with. There’re also board games in the house, and got busy with Jenga and the finger-licking Mexicana French Fries. Live music evenings are on the cards, but so are reservations for birthday and kitty parties. Open from noon to midnight this one’s okay on the pocket, if not great.